As we look back through life, it’s sometimes amazing to see how far we’ve come and how many things changed along the way. Indeed, Heraclitus of Ephesus is reported to have said ‘the only thing that is constant is change’. My brother-in-law, a UGA grad not very long ago ago, recently told me that, already, he did not recognize a lot of the bars and restaurants in Athens. It is important, however, not to be overawed by change. One of the best ways of doing that is by staying autonomous and staying engaged with the world around us. It is easy to give in to saying that our children or even grandchildren will take care of our technology for us, or that we don’t like doing something even if it’s good for us (like exercise). OLLI@UGA tries to give your autonomy and curiosity an outlet. We are never too old to learn something new, and though you may think taking a new class won’t change the world, it may well change your world. Whether it’s learning to look after your garden, how our society functions through government and politics, or maybe getting some tips on how to take a better picture with either your phone, OLLI@UGA has something that will interest and excite you. As we come up on our twenty-fifth year, OLLI@UGA has been a constant within the Athens community, although we have evolved and changed with the times, even changed our name. 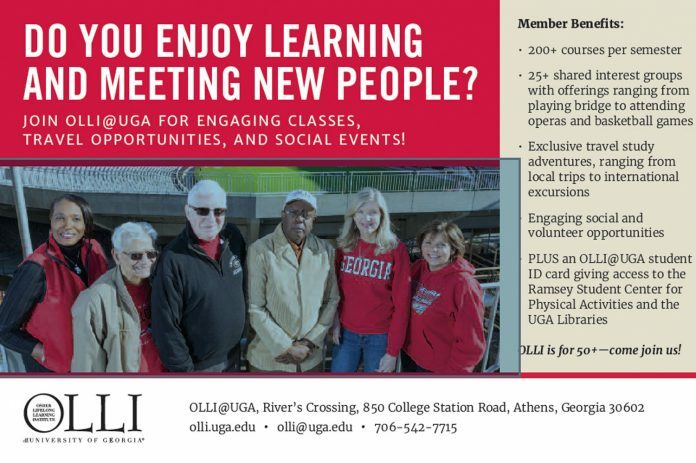 Our membership includes people from all over the U.S., who are attracted by UGA and the city. We now offer around 200 classes a semester (rather than annually), as well as trips, social events and our ever popular (and ever changing) Shared Interest Groups, aka SIGs. If you haven’t thought about signing up before, we open our new membership period in December, so there’s never been a better time to get on our mailing list or visit our website to see what is in store for 2019. We look forward to meeting you in the new year.